The typical Sun Valley Resort visitor is a middle-aged, American father who makes a comfortable living. Per statistics from Mike Fitzpatrick, marketing manager for Sun Valley Co, this is the most resilient customer base for the iconic resort. Fitzpatrick was a panelist at last week’s Economic Summit and he sat down with the Idaho Mountain Express to crunch the numbers. About 55 percent of Sun Valley Co. customers are male, regardless of the season. However, the average age decreases slightly in the wintertime, from early fifties in the summer to late forties in the winter. Forty-one percent of guests are married with children, Fitzpatrick said, and the majority of those children are between the ages of 6 and 15. These are “sweet spots,” he said, for family programs and recreation activities. 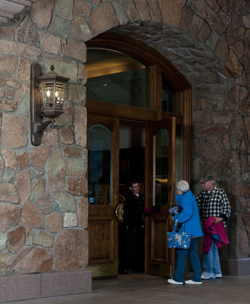 Guests are overwhelmingly American – nearly 100 percent, which is interesting considering the resort’s Austrian-heavy history, Fitzpatrick said. Australians and Europeans make up the strongest minority demographics – although the latter visitors are apt to stay a while. Americans take shorter vacations than their European counterparts, a trend that has picked up in the last 15 years. They might take more vacations, Fitzpatrick said, but they’ll be four-day trips instead of a week. This is supported by statistics from the Bureau of Labor and a “Vacation Deprivation Study” conducted by travel website Expedia. Following a 13-year study on Americans’ vacation habits, Expedia found that citizens typically used 10 of the 14 allotted vacation days they received annually in 2013. French citizens received more vacation time, some 30 days a year, and use all the time given to them, the study found. Those who stay at the resort generally rank in the higher U.S. income brackets – the largest demographic makes close to $170,000 annually, Fitzpatrick said. People are staying longer in the winter, Fitzpatrick said, and are diversifying their recreational hobbies. He cited the Sun Valley Co.’s increasing interest in connecting to the greater Idaho community – the burgeoning commerce and opportunities in the Magic Valley are something they’d like to be part of, he said. Sun Valley provides an authentic experience to guests and the celebrity complex that has historically defined the area isn’t indicative of the real people that live in the Wood River Valley, he said.